A Civil Servant home watch services specializing in the care and security of your second home, vacation homes, condominiums and investment property for absentee owners. We provide quality home care in the areas of Fort Myers, Estero and Bonita Springs. Having a home watch service is necessary to protect your investment from potential threats of home Intrusion, water damage, storms, pests and other unforeseen events that could and do occur. Our purpose at A Civil Servant home watch services is to provide homeowners with the peace of mind that their property is protected and maintained during their absence. We will take care of everything while you’re away just like you would if you were here. If you spend an extended amount of time away from your S.W. Florida home or condo we offer weekly, bi-weekly and monthly home watch packages. In addition to the A Civil Servant plans we provide an extensive concierge menu to help you manage your life and vacations more effectively. We will attend to your specific requests in addition to our home watch checklists. Relax and enjoy your time away while a home watch representative supervises home repairs, handles deliveries and prepares for your return. Contact us to learn more about our services and/or to set up a free consultation for your home watch needs. Each client is unique, and we will develop a home watch service package just for you. Take pleasure in knowing your home will be in the same pristine condition you left it in – until you return! Are you searching for a company you can trust to assist you with roof cleaning, window cleaning, pressure-cleaning or cleaning of the entire exterior of your home, condo, high rise, business or commercial enterprise? Most people want a service they can rely on – easy to deal with, pricing that is clear, showing up on time and a professional delivery of service. We not only want to meet your expectations, we want to exceed them and you to be delighted with the results. 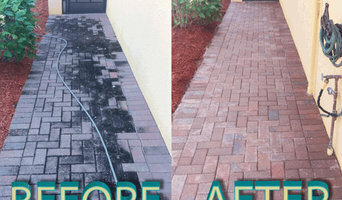 Smart Pressure Cleaning, Naples, FL. We are a family owned and operated pressure cleaning company. We have been in business for over 13 years serving the Naples, FL area. Years have passed and with them we have gained valuable experience and insights. One misconception is that more pressure is always better; however, we have found that less pressure combined with higher GPM (gallons per minute) gives better results while minimizing damage, exterior pressure washing Done Smart. Bill's Professional Pressure Cleaning | Roof Cleaning services is more than just a pressure cleaning company, We're a Family owned business that takes Pride in our work not to just make money but because we love our line of work. We are dedicated in doing the best job possible by doing as deep and clean as possible to all surfaces pressure washed. The chemicals used in any jobs are all safe and will not harm anything, including plants, animals, ect. As a family we know times can be hard financially, but things still need to be done around the house or business; well we're one in the business of pressure washing that can say we WILL work with you on a agreeable fair PRICE! So give us a call to help you with any questions you have regarding pressure cleaning or set up a FREE ESTIMATE Today. We'll come out as early as the same day of call. We'll schedule around YOU! Do you remember how exciting it was to move into your place when it was new, fresh, and clean? Let's see if we can help you reinvigorate that feeling. A clean home exterior will brighten your homes curb appeal. By enlisting our services, you're not only getting a new lease on your place, but you're also removing potentially dangerous or allergy-inducing elements. Assessment: It all starts with us taking a look at what needs to be done – and usually it's not as bad as you think. We'll let you know how long it's going to take and what it's going to require. The Preparation: We will make every attempt not to damage any plants by directing the water and chemicals away from them. We will move any patio furniture so that it does not come in contact with the cleaners. The Clean: The moment we've all been waiting for, where we get rid of all of the dirt and mold. We only use the safest chemicals, so there's very little to worry about. What do Bonita Springs, FL exterior cleaners do? Find exterior cleaners in Bonita Springs, FL on Houzz. Search the Professionals section for Bonita Springs, FL exterior cleaners or browse photos of completed projects and look for the exterior maintenance professional’s contact information.